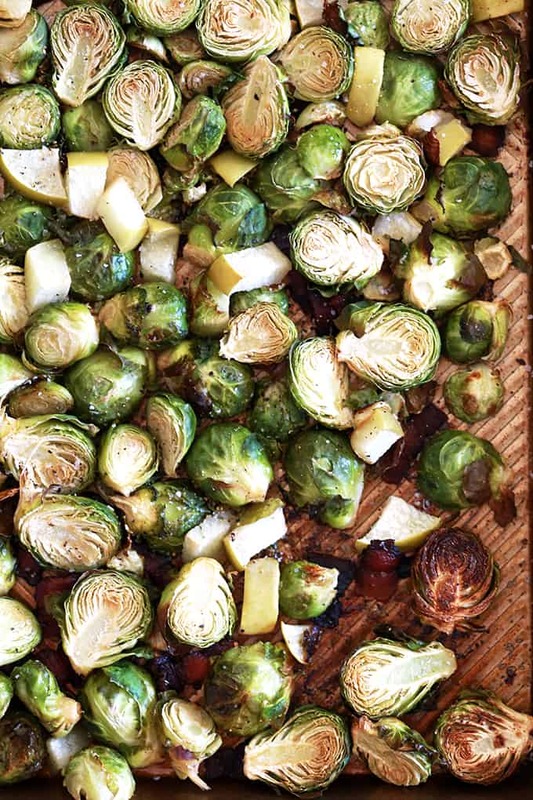 These Roasted Brussels Sprouts with Apple and Bacon will become a Thanksgiving dinner staple. Tender roasted Brussels sprouts, crispy bacon and sweet apple come together to create a simple, yet satisfying, holiday – or anytime! – side dish. These Roasted Brussel Sprouts with Apple and Bacon were one of the side dishes I made at the first Thanksgiving I cooked on my own. I would’ve never dreamed of serving Brussels sprouts on Turkey Day but page after page of magazines I flipped through contained recipes for them. Now, years later, I wouldn’t dream of not having them on our Thanksgiving table. If I can have my meat and potato eating husband and father-in-law practically inhaling them, believe me, you’ll love them too! 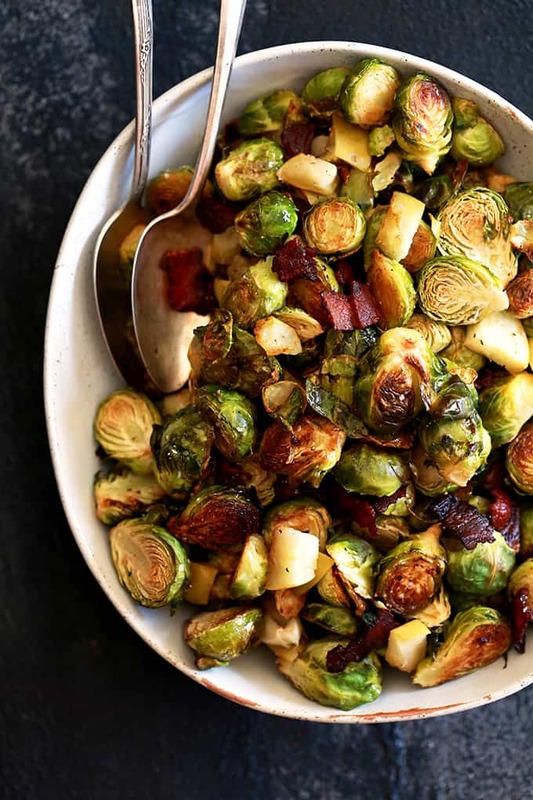 Tender roasted Brussels sprouts, crispy bacon and sweet apple come together to create a simple, yet satisfying, holiday – or anytime! – side dish. It’s that classic sweet and salty combination, but this time with vegetables involved. 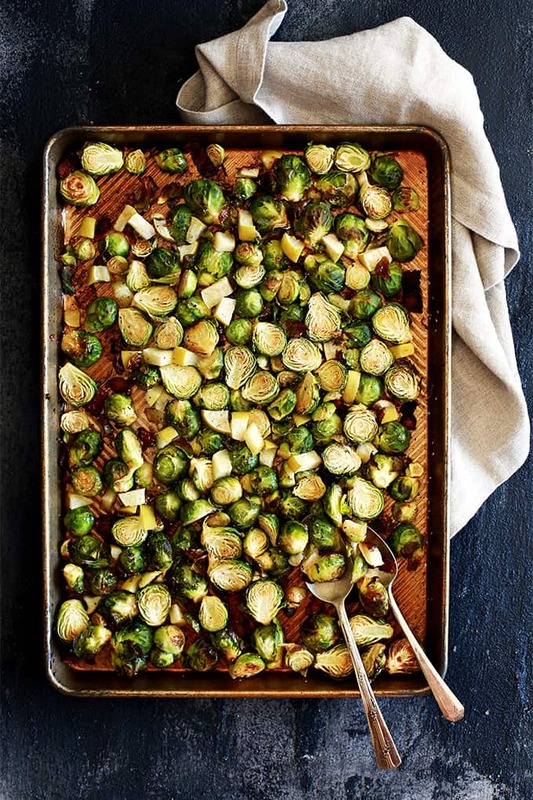 Believe me when I say that these Roasted Brussels Sprouts with Apple and Bacon will become a Thanksgiving dinner staple, right alongside my Make Ahead Sweet Potato Casserole, Twice the Onion Green Bean Casserole and Slow Cooker Cornbread and Sausage Stuffing. If you’re looking for a different Brussels sprouts and fruit combination, you might want to give my Roasted Brussels Sprouts with Lemon and Greek Yogurt a whirl. 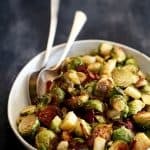 These Roasted Brussels Sprouts with Apple and Bacon are great served direct from the oven or at room temperature which means you can make them ahead of time to cut down on dishes vying for oven real estate and for your own meal planning sanity. I often will make them right before I start preparing the gravy and nearing the home stretch of my Thanksgiving cooking marathon. The only downside is that because they’re already prepared and sitting on my kitchen counter, I tend to keep stealing bites leaving me with a less full bowl to bring to the table. Then again, I’m thinking that’s only a downside for those sitting around my dinner table, not me. Another reason I love this delicious side dish? I end up using the few leftover strips of bacon and stray apple left behind in the fridge. Please tell me I’m not the only one that ends up with these! 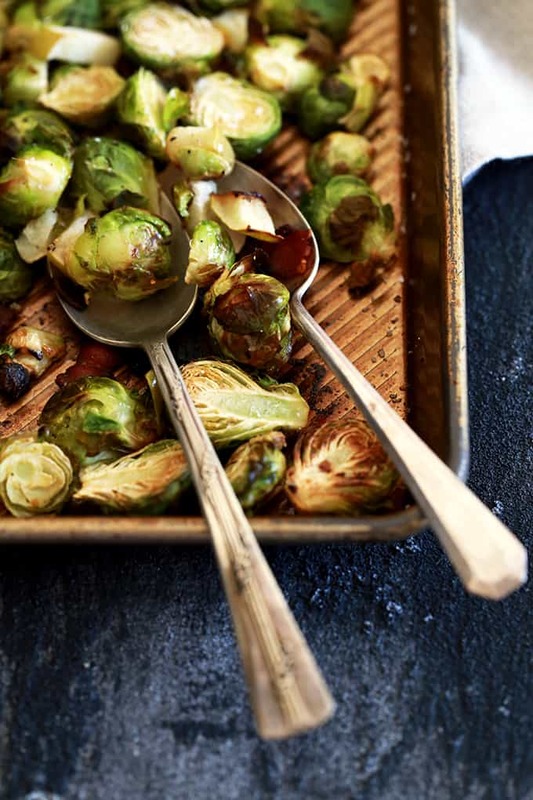 Use any kind of apple you’d like for these Roasted Brussels Sprouts with Apple and Bacon. The Granny Smith variety are my favorite and I typically have them on hand so that’s what I’ve used in the photos. Using a red variety is a great idea for Christmas or to add a pop of color to your dish. The choice is yours. Believe me when I say that these Roasted Brussels Sprouts with Apple and Bacon will become a Thanksgiving dinner staple. 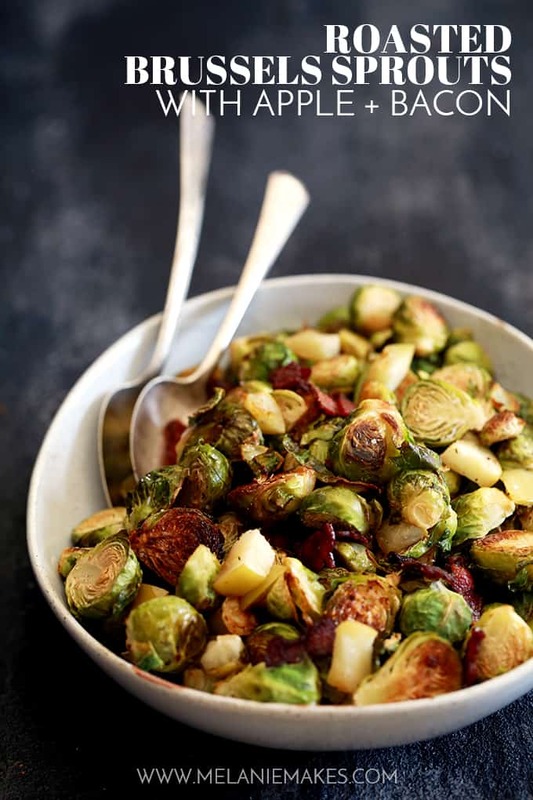 Tender roasted Brussels sprouts, crispy bacon and sweet apple come together to create a simple, yet satisfying, holiday – or anytime! – side dish. So many Brussels sprouts, so little time! Lovers of those little green cabbages will also want to check out these luxurious Creamed Brussels Sprouts, crunchy Garlic Parmesan Roasted Brussels Sprouts Recipe and these colorful Shredded Brussels Sprouts Recipe with Pistachios, Cranberries and Parmesan. I love roasted Brussels sprouts, and I've had them all kinds of ways, but never with apples and bacon. Perfect for fall! They are my favorite way to enjoy Brussels sprouts! This sounds amazing! I love the flavors you have! This looks really delish! A sure hit in my house! It's been a staple each and every Thanksgiving that I've hosted! The perfect side dish!! A must make for the holidays!! Wow, this is a really great idea for Thanksgiving. I have to try this! Looks amazing! Perfect. This is a great idea. Thank you for sharing this great recipe. Such a great idea to add apple and bacon!!! So great for the holidays! Thanks, Lora - it's one of our favorites! Roasted Brussels sprouts are one of my favorite veggies! I LOVE that you added apples! One of my favorites as well, Dorothy! Any recommendations making this stove top in a Dutch oven? Hi, Jessie - Sorry, I haven't tried it this way as you'll really want the brussels sprouts in a single layer so that they roast instead of steam. Hi! !Looks delish! Can't wait to try this on Thanksgiving! What kind of Apple would you suggest using? I want to add color to the dish so I was thinking a red one but not sure which would be the best for roasting...thanks! 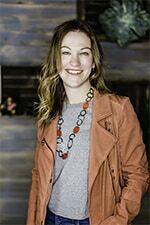 Hi, Felicia - I love the tart flavor of a Granny Smith but I've also used Honey Crisp, Red Delicious or whatever else I happen to have in my crisper. You really can't go wrong! Just made this and absolutely delicious! I added toasted walnuts and grilled some pork steak loins covered in rosemary, black pepper, salt and extra virgin olive oil. By far my favourite first attempt meal! So thrilled you enjoyed them, Bec - they're definitely much loved at our house! I'm looking for a new recipe to make for the holidays. My two goals: a vegetable and healthy. Do you think this recipe could be used with turkey bacon and achieve the same raves? Assuming the recipe directions would need to be altered....suggestions? Hi, Chris! I don't think the turkey bacon would render as much fat, but otherwise it would work! I'd likely try preparing the turkey bacon separately and then tossing it with the Brussels sprouts before serving. Let me know if you give it a try! I have no doubt he'd give them a try, Ashlyn! Thank YOU so much for sharing my recipe, Katie. So appreciate it! This was so delicious, my family loved it and has already asked me to make it again. Thanks for sharing this recipe. I'm excited to try this for Thanksgiving and have a question about the apples. I am pretty to-the-letter on following recipes the first time so I wondered how the applies were sliced into 1/4" thick. Are they thin long slices (like wedges) or is it a small dice? And then just sprinkled on top of the bacon and brussels on the pan, right? thank you! Hi, Jessica!So thrilled you're going to give these a try for your Thanksgiving meal - hope you'll let me know what you think afterwards!As for the apples, I tend to slice them into 1/4" wedges and then just another rough chop lengthwise so that they're in pretty uniform 1/4" pieces to insure they'll cook evenly. Then you'll just sprinkle on top of the sprouts and bacon that are already in the pan and you'll be good to go!Let me know if you have any other questions! Hi Melanie- I have one more question :) I believe you adapted this recipe from the Martha one but not positive. If so, she suggest 4 pints of sprouts and you 2 lbs which is half of that (i believe). Not a huge deal but just want to make sure my portions are correct. I'm a girl that needs a recipe!. does it really matter? OK- 2 lbs it is! Thanks again. Hey, G!Yes, not need to toss with oil. The lovely bacon drippings will do all the work! :)Can't wait to hear what you think. Hope you have a great Thanksgiving with your family! I'm excited to make this for Thanksgiving this year. Do you literally put the brussels sprouts on top of the bacon? and just to be clear- the bacon and the brussel sprouts are in the oven the entire time until the apples are done correct? or do you take the bacon out at some point? Thanks! Hi, Debbie!So excited for you to try this!Yes, you literally put the brussels sprouts on top of the bacon. If I'm being OCD about it, I like to put the halved end on the bacon so that it gets really brown. And yes, the bacon and brussels sprouts are in the oven the entire time. Just keep layering!Let me know what you think after you try it! Hey Melanie- Thanks for the quick reply and clarification. I'll be sure to report back.. Happy Thanksgiving! Hey swap partner! I can't wait to try this. My best friend is having a get together at her house this weekend & this is perfect. I'm glad they enjoyed the banana pudding, I've got to make one for Thanksgiving. I hope you and the family are having a great night.